The rub is from The Barbecue! Bible, p. 194. The method comes from The Complete Meat Cookbook, pp. 176-78. I feel as though I’ve graduated from high school. There’s college still to go, but at least I’ve completed my preliminary barbecue degree now that I’ve slow-grilled my first rack of ribs. A friend was coming over to share them that evening. After investigation, I decided to forego making a sauce and to combine elements of the two most appealing recipes I had. My friend and I were very happy with the results. I divided the slab of twelve ribs in half. I could only eat three out of six ribs, but he ate all six. Grilled ribs are a revelation. I had no idea how juicy and tender the meat could be. To tell the truth, I’m not sure why the ribs turned out so juicy. Maybe it was the drip pan filled with water under the ribs. Maybe it was the quality of the meat — organic pork. Whatever the reason may have been, the ribs were gloriously messy and delicious. Who needs sauce? Combine the paprika, black pepper, brown sugar, salt, celery salt, cayenne, garlic powder, dry mustard, and cumin in a small bowl and whisk to mix. Rub two thirds of this mixture over the ribs on both sides, then transfer the ribs to a roasting pan. Cover and let cure, in the refrigerator, for 4 to 8 hours. Prepare a covered barbecue for cooking: light a mound of 20 to 30 briquettes on one side of the grate and open the bottom vent fully. Place a roasting pan on the other side of the grate and add about 2 inches of water — the pan helps to catch any drippings, and the water provides moist heat to tenderize the meat. Meanwhile, if using wood chips, wrap about 2 cups of soaked hardwood chips in a foil packet and punch holes in the top to let the smoke escape (wrapping the chips in foil helps to keep the wood from burning up quickly when placed directly on the coals.) Or you can place 4 or 5 hardwood chunks directly on the coals. Once the coals are ready, lay the foil packet on the coals. Put on the rack and lay the ribs on it over the pan so that no meat is directly over the coals [(this is Indirect Grilling)]. Cover the barbecue, with the lid vent about half-open and opposite the coals, so that the smoke is drawn over the ribs. Stick an instant-read thermometer into a top vent hole, making sure that any plastic parts are not in direct contact with the metal lid, and leave it there. Ideally, you want the temperature to read 200 to 250 degrees F; initially it can be higher, but it should not exceed 300 F; it should drop down to the lower range within a half hour or so. If not, partially close the lower vent to decrease the heat. Do not close this vent all the way, however, as this would cause the coals to die out. Regulate the temperature by adjusting the bottom vent, keeping the temperature registered in the upper vent in the desired range. Every 45 minutes, turn the ribs over and switch their places on the grill so that you alternate their exposure to the hotter edge near the coals. Add another 2-cup packet of chips or 4 or 5 hardwood chunks to the coals if the hardwood has burned up. If the temperature drops below 200 F, open all the vents fully, top and bottom, and check to see if the coals have burned out or need replenishing. If so, add 5 to 10 more briquettes. Once these coals get going, you may have to close the vents partially to regulate the heat. When they are done, place the ribs on a baking sheet, large platter, or baking dish, and cover them tightly with foil. Wrap the pan or platter with 10 to 20 sheets of unfolded newspaper and let the ribs rest for 20 to 40 minutes or up to an hour before serving. Meanwhile, [if using a barbecue sauce], heat the barbecue sauce of your choice in a small saucepan. When you’re ready to serve, slice the slabs into individual ribs and brush generously with the sauce. Serve with more sauce on the side and plenty of napkins and cold beer. To begin with, I had only one 12-rib slab of spareribs that weighed 3 1/2 pounds. Given that most people in this country with charcoal grills use a standard Weber, it beats me how they fit more than one slab of ribs on a grate of that diameter. In fact, the arrangement Aidell recommends worked perfectly for one slab. The night before, I rubbed the spice mixture all over the ribs, put the slab in a rectangular pyrex baking dish, covered it loosely with foil and refrigerated it overnight. About an hour before I started the coals, I took the ribs out of the fridge and let them come to room temperature. Also, I filled a bowl with several handfuls of hickory wood chips and covered them with water to soak until the fire was ready. When I began the coals, I counted out 40 briquettes into the chimney starter, which was standing on the pizza stone, free and clear of everything combustible. While the coals were catching fire, I filled a large aluminum rectangular pan with water, about 2 inches deep and put it to one side of the bottom grate, where I poured about half the lit coals when they were ready. After putting the upper grill in place, I set the stand-up metal oven thermometer down on it and replaced the lid to let the temperature rise. All the vents were wide open. Meanwhile, I put a few more briquettes into the chimney starter to have a ready supply of hot coals. Eventually, the temperature reached 300 F and stayed there. So far, I am a complete failure at maintaining a low fire. I make sure the heat doesn’t go above 300, but I’m not very good at keeping it under 300. I put the ribs on the grill. At first, I tried the soaked hickory wood in a foil packet, but it took too long for it to heat up sufficiently to produce smoke. So, I opened it and dumped the damp chips directly on the coals, which had the nice effect of lowering the temperature a little. From that point on, I only had to check the fire every half hour or so. The temperature remained pretty constant. Every half hour or so, I threw in one or two more britquettes and a handful of soaked chips. I turned the meat four times over 2 hours. The color deepened beautifully. After 2 1/2 hours, I removed them, placed them back in the baking dish, covered it with foil and wrapped it in newspaper. That was a great idea. 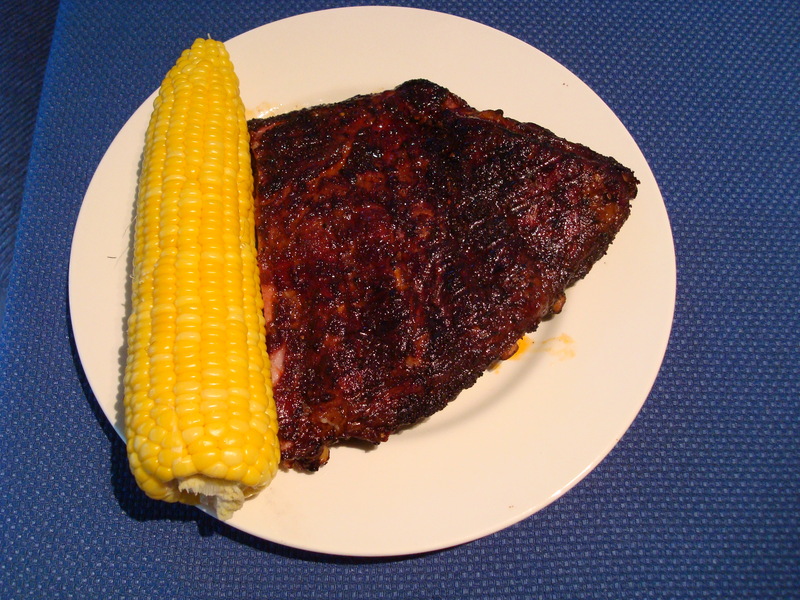 While the ribs rested, I put two unshucked ears of corn on the grill and covered it. 20 mins later, they were done. As good as they were and as melted as the fat was, next time I’ll cook them for 3 hours. They were juicy enough that half an hour more would not have dried them out. Why anyone would put sauce on them I can’t imagine, because the rub had mixed with the meat’s juice to form a sauce on the surface. And they certainly were messy enough to eat with our fingers. I can’t imagine a gas grill producing ribs as delicious as these were. Still, I’m not sure I would try more than one slab on a grate that size. Update, 21 August 2008: With the help of a friend, I solved the problem of two slabs on the grate. As it should be clear in the second image I posted, I leaned the slabs up against each other to form a tent. This procedure solved a few problems. Now, I can cook two big slabs on a Weber grill grate. Second, the fat on both sides of the ribs drips into the pan. And I don’t have to turn the ribs over — or, at least, I don’t believe I have to. They are still on the grill with an hour to go as I sit here typing. This time, I’m cooking them a full three hours. I have a question about the soaked “chips” you used. I don’t have any on hand, but I’m out here on the ranch surrounded by oak trees (but, alas, not hickory trees). Can I just use small pieces of wood after I soak them? Or, alternatively, would this method work as well if I don’t use soaked chips? I’m using hardwood lump charcoal. Soaked oak chips are not nearly as good as hickory, but better than nothing. Break up the oak sticks into smallish sizes, but be sure to have a lot on hand.